Informatics is the key enabler for all research and translational activities. It is also at the center of innovations that transform the ways in which biomedical data are collected, shared, and analyzed, leading toward new frontiers of research and discoveries. At the CBMI, we strive to build a research-facilitating informatics infrastructure by deploying and harmonizing state-of-the-art software systems and adopting best practices. We created, and will continue to grow, a dedicated translational informatics team that not only serves routine functions, but also excels in conducting cutting-edge original research in biomedical informatics. We have also assembled a strong informatics leadership team with broad representation of key stakeholders from our medical center and across campus, to ensure seamless integration of our translational informatics work with clinical IT operation; and buy-ins from experts in relevant disciplines such as information and computer sciences. Above all, we work diligently with our end users—researchers, healthcare practitioners, patients, families, and communities—to make sure our informatics tools and services are optimally used to achieve a true impact on advancing the science of translational research. The leadership team of CBMI consists of nationally renowned scholars in biomedical informatics and IT leaders at UC Irvine Health, silos that are often difficult to connect. This purposeful organizational strategy has created a multidisciplinary group of key stakeholders that have a track record both in conducting cutting-edge scholarly work to advance clinical and translational science, and in providing state-of-the-art informatics support for research. 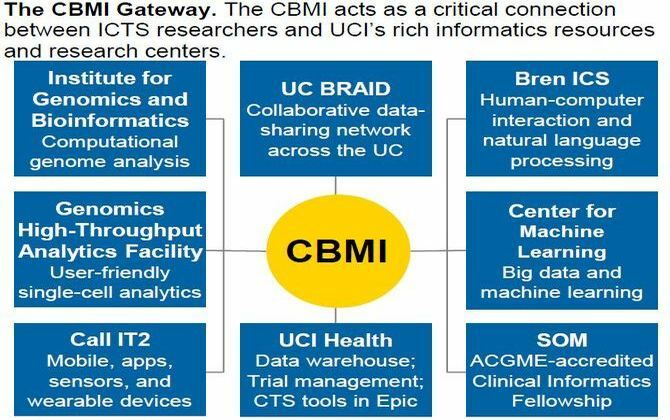 The Center for Biomedical Informatics (CBMI) supports and accelerates ICTS’ mission by providing essential informatics methods, infrastructure, and services to researchers, clinicians, and patients at UC Irvine, at our partner institutions, and across the CTSA Network. Over the past ten years, the CBMI has grown from a supporting unit into an engine of transformation that powers a full range of research, education, results translation, and community engagement activities. By drawing upon the outstanding pool of talent from UC Irvine’s top-ranked schools and programs (e.g., the Donald Bren School of Information and Computer Sciences, the Institute for Genomics and Bioinformatics, and the Henry Samueli School of Engineering), CBMI serves a critical concierge role of connecting health sciences researchers with expertise in emerging domains of -omics analysis, machine learning, and ubiquitous computing. Infrastructure, Tools, & Services: The CBMI manages a wide array of informatics applications to support clinical and transitional research activities at our Hub. These include enterprise systems such as OnCore (Forte Research Systems, Inc. Madison, WI) and Freezerworks (Dataworks Development, Inc., Mountlake Terrace, WA); and commonly used tools such as REDCap for electronic data capture; Tableau for data visualization and analysis; and i2b2 for cohort discovery. We also provides a HIPAA-compliant research data environment called myResearch Portal, built using the Virtual Desktop Infrastructure (VDI) technology. Since 2011, we have had an enterprise-wide Clinical and Research Data Warehouse (CRDW) that serves the dual purpose of quality improvement and clinical and translational research. The CRDW constitutes the backbone of our enterprise data analytics service. It also fuels several cross-institutional research data networks of which we are part, such as NCATS Accruals to Clinical Trials (ACT) and the National Patient-Centered Clinical Research Network (PCORnet). With the CRDW, we created an Honest Broker mechanism for furnishing de-identified patient-level EHR data to authorized users with proper IRB approval. Our Honest Brokers are professionally trained business intelligence analysts versed with working with researchers to develop complex SQL queries. Networked Collaborations: As part of the University of California Biomedical Research Acceleration, Integration, and Development (UC BRAID) collaborative, CBMI led the implementation of the i2b2/SHRINE-based UC Research Exchange (UCReX) network to enable cohort discovery across the 5 UC medical campuses. We are also working with UCSD on the patient-centered SCAlable National Network for Effectiveness Research (pSCANNER), one of the 34 research data networks that comprise PCORnet. pSCANNER utilizes a distributed architecture that builds upon the Observational Medical Outcomes Partnership (OMOP) Common Data Model (CDM). 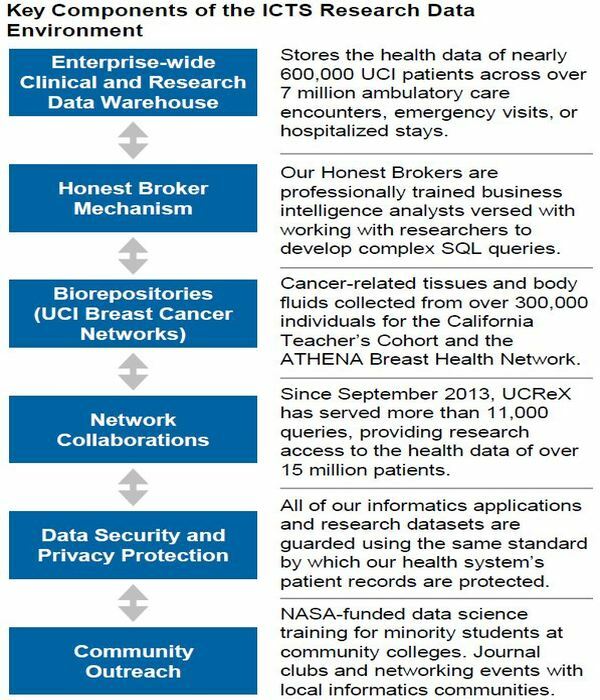 In 2015, the UC Office of the President authorized a landmark project to create the UC Health Data Warehouse (UCHDW) to store the health records of over 15 million UC patients to improve coordination of care and the efficiency in conducting multisite CTS research. Dr. Lisa Dahm, Associate Director of the CBMI, chairs this effort. UCHDW is an unprecedented collaboration across the UC to combine and harmonize patient records in a centralized environment, thus transforming our collective clinical data resources into a strategic asset to support data-driven decision making and research. It also provides an opportunity to grow and strengthen our CRDW team to meet the ever-increasing data needs of our CTS researchers and to better serve the UC CTS community at large. Data and System Interoperability: CBMI has developed extensive experience with standard terminologies, common data models, data exchange protocols, and federated database systems. The clinical data in our EHR and CRDW are encoded in, or mapped to, in real time, controlled medical vocabularies such as LOINC, RxNorm, CPT, and ICD. Our CRDW adheres to the NIH Common Data Elements specifications and is compatible with i2b2, OMOP, and Mini-Sentinel/PCORI CDM. Besides adopting existing standards, the CBMI has actively engaged in developing new standards in areas where standardized approaches for recording and interpreting data are lacking. We currently lead the THEMES project to improve the interoperability of data and results for cardiopulmonary exercise testing (CPET). Through this project, we have partnered with HL7 to create a formal Domain Analysis Model (DAM), which was published in March 2018. The THEMES DAM has been adopted by the NIH Common Fund Study Molecular Transducers of Physical Activity (MoTrPAC) and by the European Working Group on Pulmonary Function Testing. Biomedical Informatics Research: In the past few years, we made significant investments in developing research capacity at the CBMI. Through this effort, we have built a strong presence in the biomedical informatics research community by conducting high-quality original research and publishing in high-impact venues. Our research today covers a variety of topics including human–computer interaction (HCI), natural language processing (NLP), computerized clinical decision support, and social media analysis. We are part of an NCI-funded U24 project to develop and disseminate a Google-like EHR search engine called EMERSE across five NCI-designated comprehensive cancer centers. We are also part of an NHGRI-funded study, led by UC San Diego, to develop an electronic informed consent management system called iCONCUR that allows patients to express preferences for sharing their clinical data and biospecimens for research. Education and Workforce Development: Our two-year Clinical Informatics Fellowship program received ACGME accreditation in 2017, making UC Irvine one of the 27 institutions that offer clinical informatics fellowship training. CBMI provides research seminars and research rotation opportunities for the fellows. Supported by the CBMI, UC Irvine established an undergraduate minor program in health informatics in 2011. We are also in the process of developing a Graduate Certificate Program in Biomedical Informatics in collaboration with UC Irvine’s Division of Continuing Education, Department of Informatics, and the MS Program in Biomedical and Translational Science. This program will be offered on a part-time basis, primarily targeting clinician scientists and working healthcare professionals who wish to develop informatics competencies but not yet in a position to pursue a full-time graduate degree. Community Outreach: The CBMI has worked diligently with our local communities to promote informatics education and outreach. In collaboration with California State University, Los Angeles, we received a NASA training grant (“Data-Intensive Research and Education Center in Science, Technology, Engineering, and Mathematics”) to create data science training and research opportunities for minority students. We recently co-hosted the 2018 UC Health Data Day with UC San Diego with broad participation from industry and local communities to tackle grand challenges in health data sciences. In conjunction with the US DHHS, CBMI will host the November 2018 UC Irvine Health Hackathon that will focus on informatics approaches to mitigate the opioid addiction crisis. technology. myResearch Portal is built in with commonly used statistical tools (e.g., SAS/JMP, SPSS, R) to facilitate data analysis without the need to copy data out of the Portal. To date, our Clinical and Research Data Warehouse (CRDW) stores comprehensive health data of more than 600,000 UC Irvine patients collected from over 7 million ambulatory care encounters, emergency visits, or hospitalized stays. As of May 2018, the CBMI Honest Broker team has fulfilled over 1,000 research data requests using the CRDW platform, contributing to significant clinical and translational efforts such as NIH’s All of Us Research Program. Using Freezerworks (Dataworks Development, Inc., Mountlake Terrace, WA), we created a virtual biobank that integrates information from multiple biorepositories to provide researchers one-stop, easy access to the metadata of all biospecimens stored at UC Irvine. These biospecimens are acquired for both clinical purposes (e.g., cancer pathology) as well as for research, such as the Breast and Other Cancers in the California Teacher’s Cohort and the ATHENA Breast Health Network, two UC Irvine-led large cohort studies that have collectively collected cancer and related tissues and body fluids from more than 300,000 individuals. CBMI led the implementation of the i2b2/SHRINE-based UC Research Exchange (UCReX) network to enable cohort discovery across the 5 UC medical campuses. Since its debut in September 2013, UCReX has served more than 11,000 queries, providing research access to the health data of over 15 million patients. It has played an indispensable role in the conception, design, and conduct of numerous multisite studies within and beyond the UC. For example, the cross-institutional data querying capability enabled by UCReX allowed UC obstetrics researchers to participate in COMPARE-UF (Comparing Options for Management: Patient-Centered Results for Uterine Fibroids), a $20 million PCORI/AHRQ award. The research work being conducted at the CBMI has started to make an impact in the biomedical informatics research community. In 2017 alone, we published over 20 research papers in Journal of the American Medical Informatics Association (JAMIA) and AMIA Annual Symposium Proceedings. These papers covered a variety of topics, including: human–computer interaction, medical word sense disambiguation, and computational social media analyses. Our two-year Clinical Informatics Fellowship program received ACGME accreditation in 2017, making UC Irvine one of the 27 institutions that offer clinical informatics fellowship training. CBMI provides research seminars and research rotation opportunities for the fellows. Since 2011, our undergraduate minor program in health informatics has graduated nearly 500 students, who may seek life-long careers in biomedical informatics and become leaders of the field.